Last week was a quiet week for our titanic team. With two professors out for various reasons, the fantastic five only had one class to attend on Thursday night. What lay before them was a week of reading and opportunity. Admittedly, the students took the week a little easier and devoted time to other things, such as Skype conversations with friends and family from home, work on wedding plans, playing video games, and catching up on television shows. Once the valiant men purchased their coats of warmth and wonderful comfort and put on that cloth that fended off wind and cold with the awesomeness that permeated every stich—and the girls did their thing and bought various article of clothing—the group ran to Greggs for a bite to eat (this chronicler assigned to record various adventures of the Quintessential Quintet cannot remember which Greggs they went to, as there seemed to be one at the end of every street in the city). Then they ran back to the train, so that one particular girl of the group could get back to home base (i.e. the girls’ flat) for a quick nap before she went off to walk a friends’ dog. The rest of the week was filled with more reading and much screen watching. The couple and their faithful friend finished Legend of Kora, the first season and began the second season. The mighty men of the five also diligently trained their beloved Pokémon on their video games. One of the men searched on his game for a certain Pokémon of incredible strength for several hours, of which he comments in a recent interview, “I see now that it was pretty much a waste of time. I have a feeling if I actually spent more time reading and working on my studies, I wouldn’t be as frustrated as I am and more inclined to be patient. Now I am behind on my work and all for nothing.” Well, folks, looks like even the quintessential quintet are human. The same young man (i.e. me) later on found the Pokémon he was looking for, though now he is putting his free time back in its place, not letting it push out responsibilities, in order that the day would be better used for God’s glory. Thanks be to God that He is patient in our foolishness! So after a week of touring around lots and lots of places (on the Reformation Tour), this week was a bit slow in comparison. Nevertheless, it was still fun! Sunday, we went to church, had lunch at Beth’s, I went back to the flat and took a nap, then we went back to church, and after the boys and I played Pokémon (what else is new?). On Monday, we had worship, and read in the morning, and had lunch. Then David, Ethan, and I went to the charity shops in Airdrie, looking for coats for the boys. We didn’t find any coats, but it was still fun traipsing about the town…in the rain. The three of us usually have fun together no matter where we are though, so the rain didn’t bother us. We went back to the church and read some more, and then we went to the boys’ flat for dinner. Afterwards, they played Pokémon and I read some more for class. 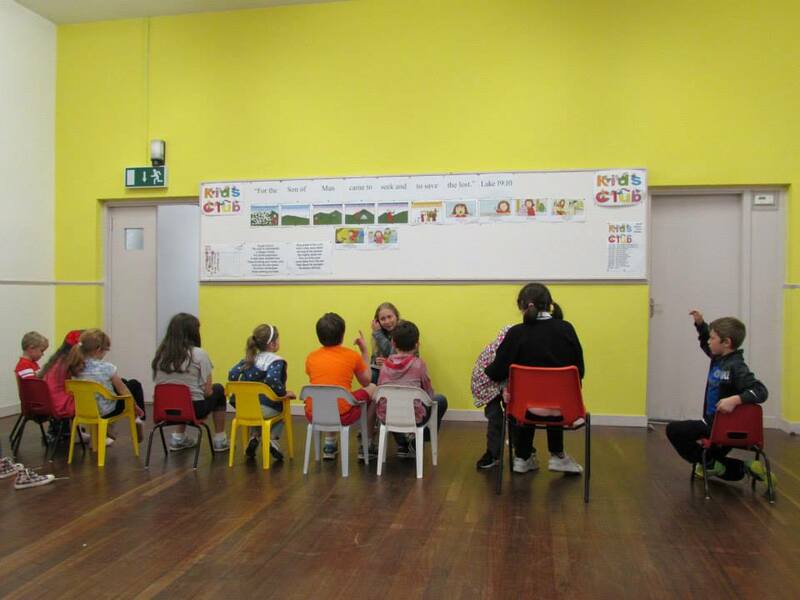 Tuesday, we had worship, we read in the morning, and then we ate lunch. We came back to the church and had Church Ministry with Andrew where we talked about making space to spend time with God. It was another great class that was very thought provoking. Next, we had our class on Paul, and then our book discussions. After, we went to our respective flats since the boys didn’t have MET. I read some more, and then went to Tesco with Jennie for groceries. I finally had dinner (it was pretty late) and read some more before I went to bed. Wednesday, we had worship and then had Systematic Theology with Kenneth Stewart. It was another mind blowing seminar as we learned about the Law. The most mind blowing part was when Kenneth said that in Exodus 20, God literally spoke the Ten Commandments to all the people from the mountain, and then it happens again in Matthew 5-7 when Jesus is on the mountain and speaks about the Law. (Sermon on the Mount). It was pretty cool. 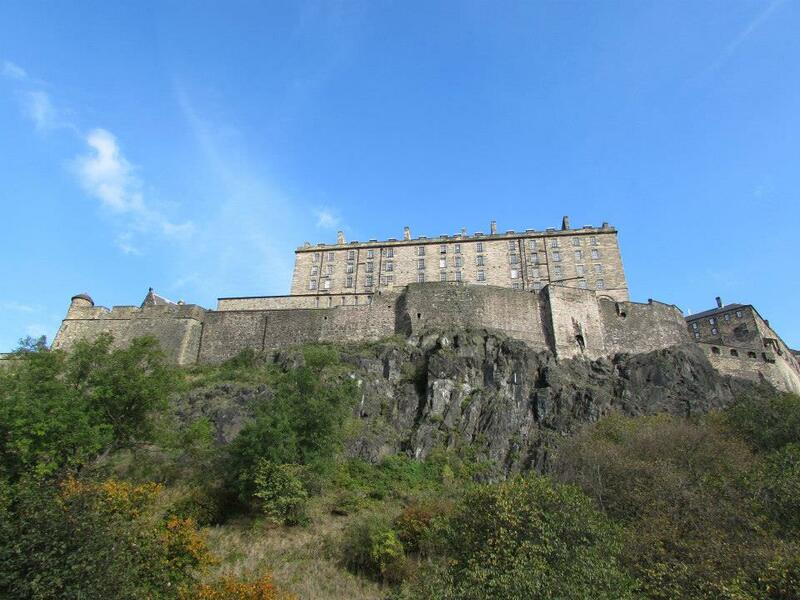 After class, we had a quick lunch, and George took us to Edinburgh and dropped us off near the castle. We explored there for a few hours and then had dinner at George and Jeanette’s. It was scrumptious! After, the girls went to their MET, and the boys went to their flat. Thursday, we had worship and then read in the morning. After lunch, we had a catch up Paul class, and then we went back to our flat. I decided to take a nap because I didn’t feel well, and I was super tired. After a quick dinner (just a snack, really), we went back to the church for our Reformed Evangelism class. Friday, we had worship, and we read in the morning. It was a bit cold in the church that day so David, Ethan, and I sat in front of the heater. It was pretty funny. I made lunch for the boys back at the girl’s flat, and we watched an episode of Agents of S.H.I.E.L.D. Then we went back to the church to get ready for Kid’s Club. 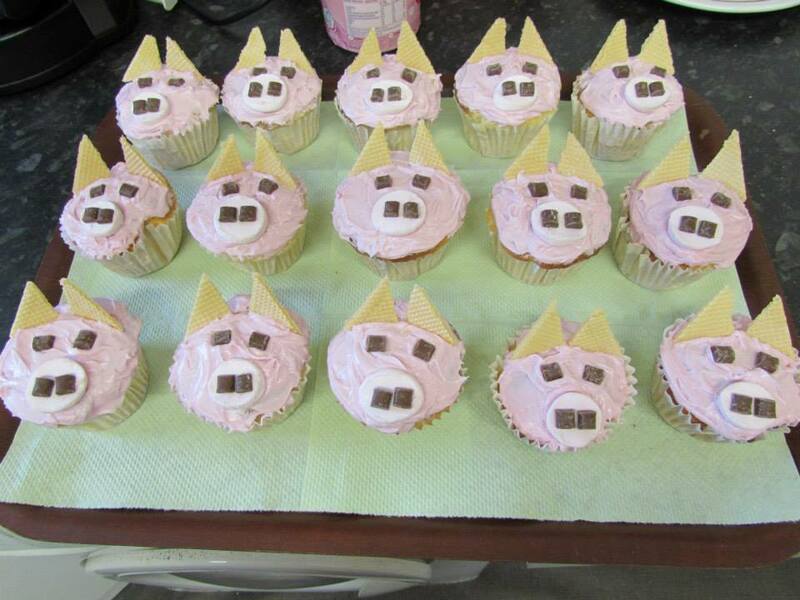 I baked cupcakes and decorated them like pigs! While they were baking, I got the craft ready too. 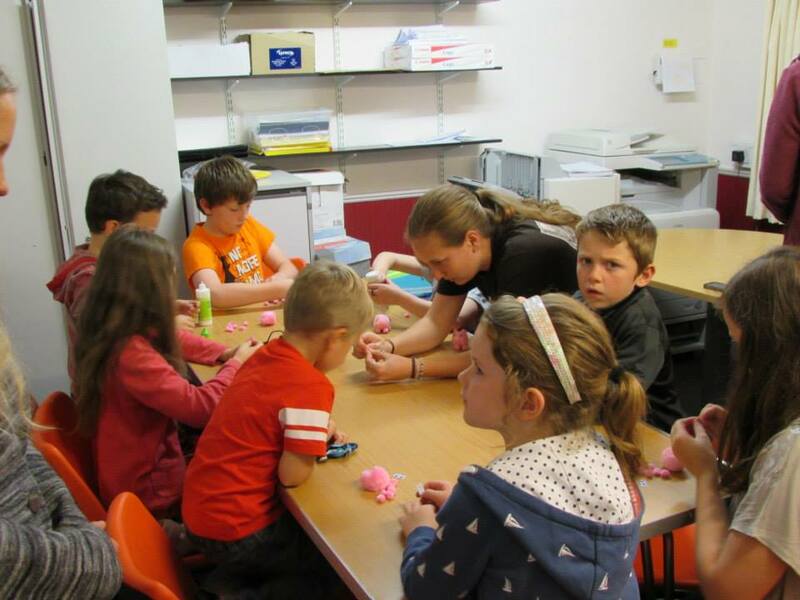 We made Pom Pom Pigs! They were sooooo cute! And Fluffy! When the kids came, we played a game, but it didn’t last very long. Then we had the Cupcakes for snack! Everyone loved them. We then had the songs, Psalm (that I made motions up for), and memory verse. Then Rosie told the story of The Prodigal Son. I led the craft, and they played a time-killer game (Pig, Pig, Farmer). Since there wasn’t CY afterwards, David, Ethan, and I went back to their flat and we chilled, and played, and watched Pokémon. Saturday, I slept in and then cleaned our flat from top to bottom while Jennie and Rosie were out. David, and eventually Ethan, came over to keep me company. When I was finally done, we went to the boys’ flat and made dinner. Then we watched and played Pokémon, and when it was available, we watched the new episode of Doctor Who. After a long day, David walked me back to my flat, and I went to bed. Hola. Hallo. Bonjour. How’s it going? Hope all you guys out there in cyberland are doing great. We here in Scotland have been getting along fabulously! We’ve been here for about a month and a half, it’s crazy how time flies. This week, after studying Scottish Covenanter and Reformation history with the brilliant Professor Jimmy Fisher, we embarked on a journey through time. The amazing Helen Fisher navigated us through the twists and turns, while Prof. Jimmy was our guide. Monday we began our eye-opening journey in the beautiful St. Andrews. 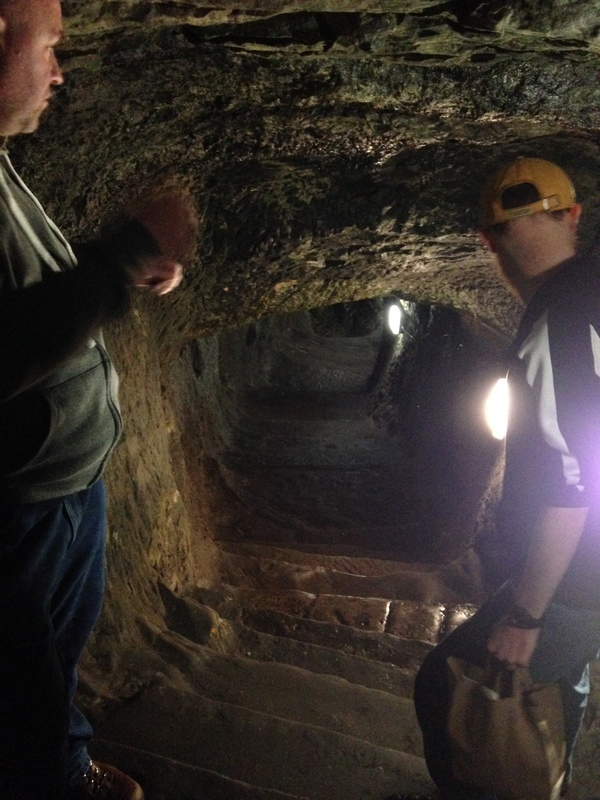 At the castle, we climbed through an old tunnel half dug by the Covenanters who held the castle captive and the other half dug by professional French miners. 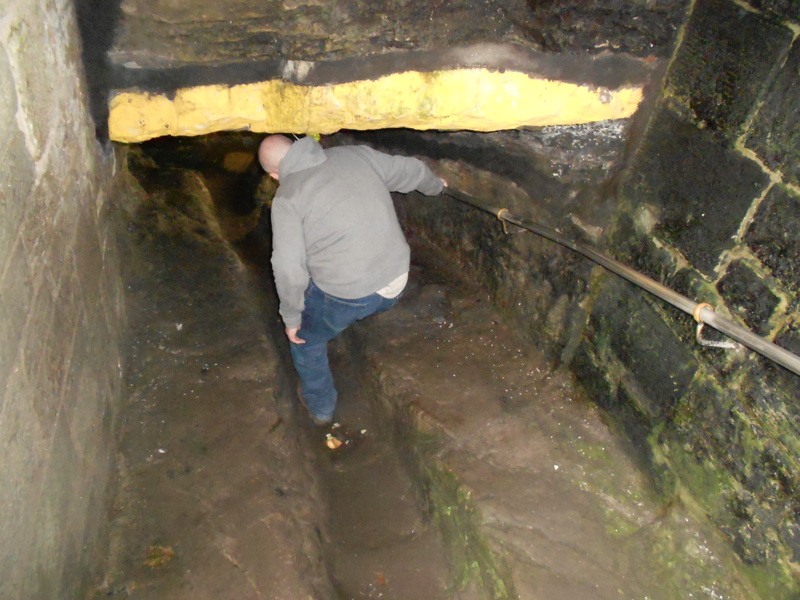 The tunnel is still standing, despite being constructed in 1547. After some more exploration through the history of St. Andrews, we traveled to Magus Muir. Magus Muir is the site of the execution of Archbishop Sharp. 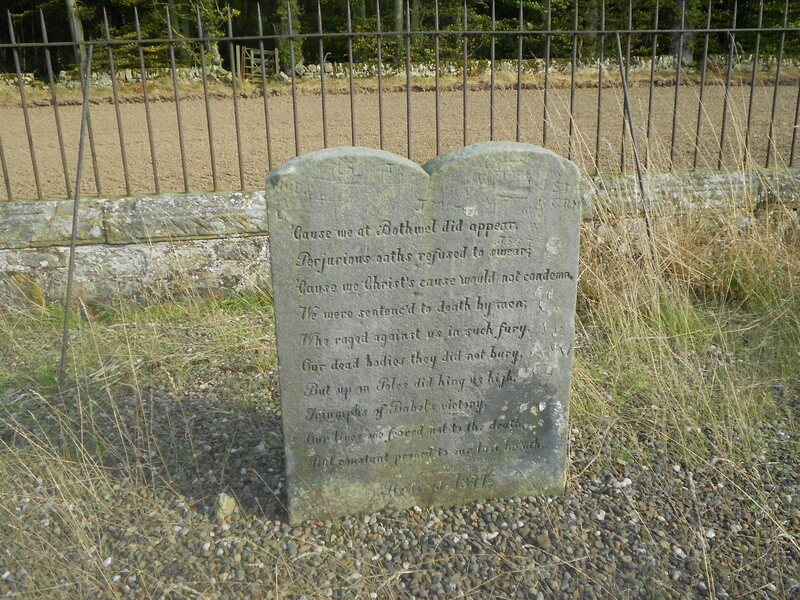 Not far from the memorial for Sharp, is a grave in a field marking the site where five random Covenanters were killed as a repayment for the death of the archbishop (even though they did not commit any crime). Memorial to the Covenanters at Magus Muir. 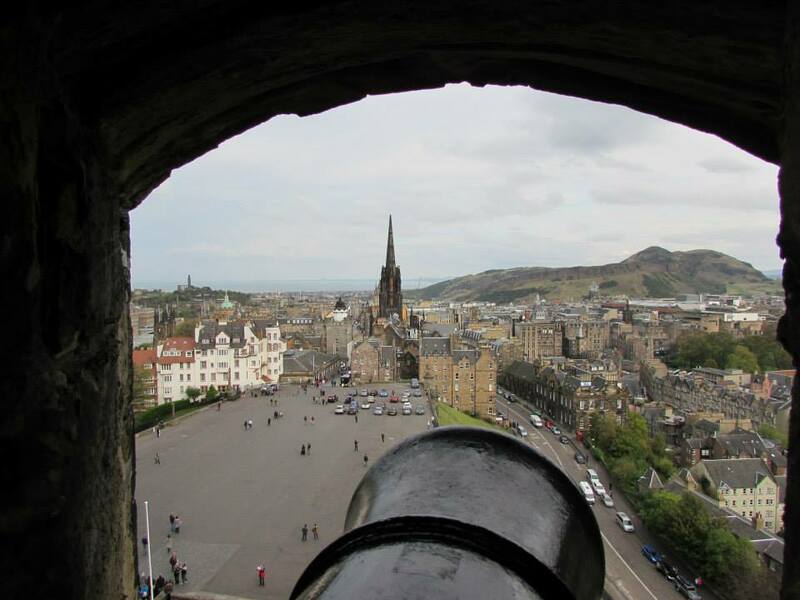 Tuesday, we traveled by train to Edinburgh, and Jimmy guided us through many sites in record time. 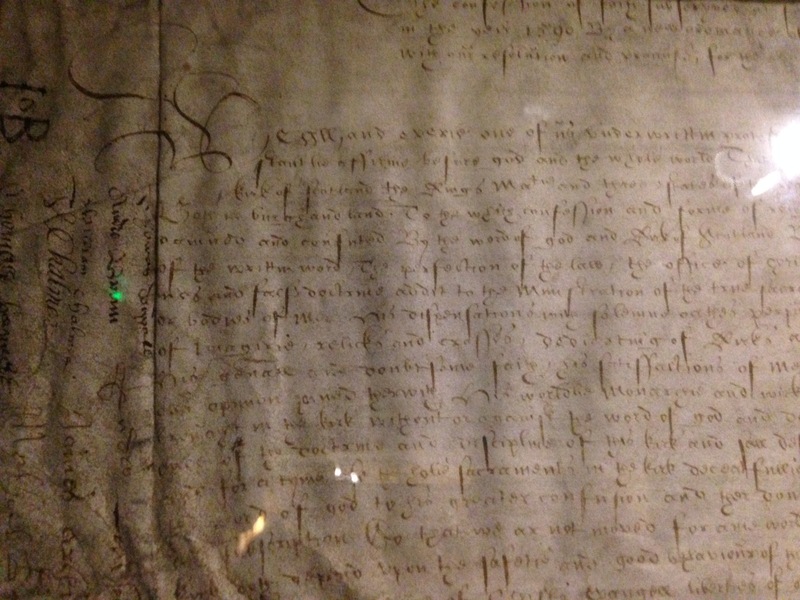 If I had to narrow down my favorites from Edinburgh to two, they would probably be the National Covenant and the site where the Covenant was signed. 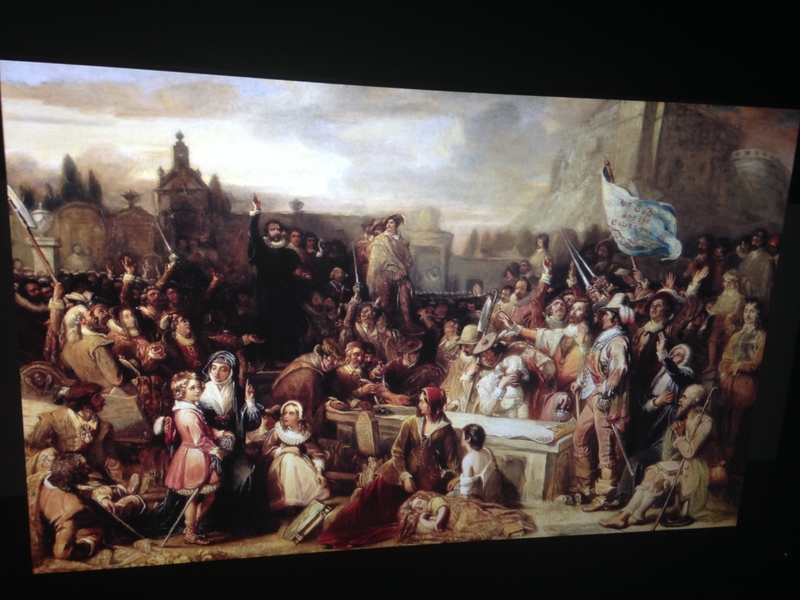 In 1638, the National Covenant was signed in Greyfriars Cemetery. Some of those who signed the Covenant did so in their own blood. We were able to see the grave that the Covenant was signed on, and then we were able to see that actual Covenant. It was amazing to see a document that held so much weight for the church and for the country as a whole…and we got to see where it was signed. Painting of the signing of the National Covenant. 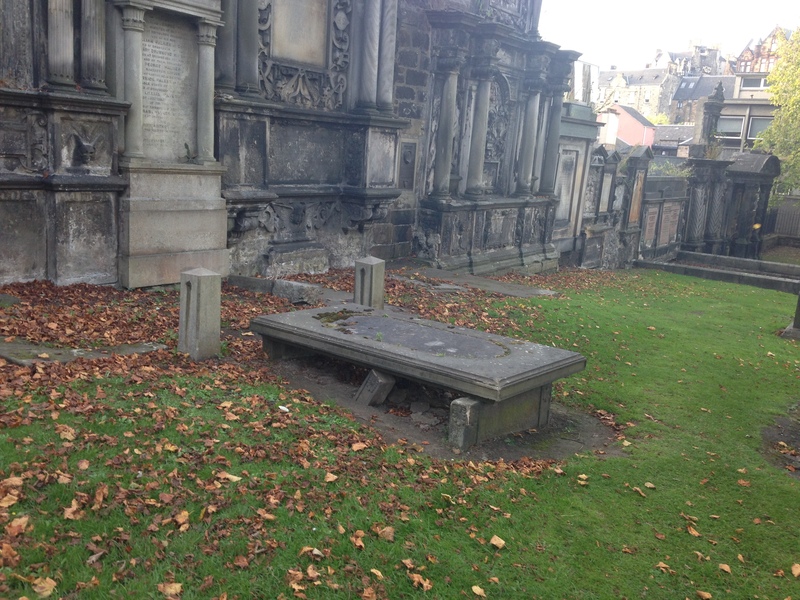 Greyfriars Kirkyard where the National Covenant was signed. Wednesday, we traveled around to some new sites. 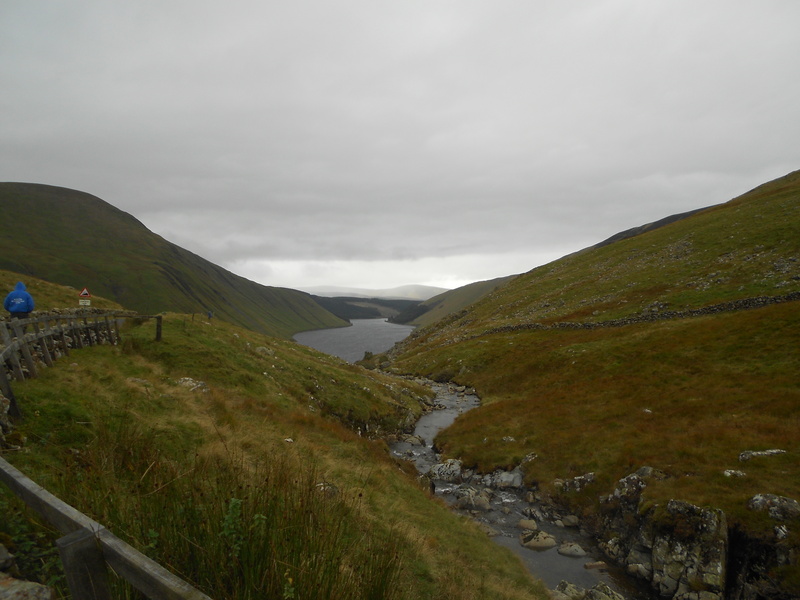 The two that stuck out the most for me were the Talla Linn and the Devil’s Beef Tub. 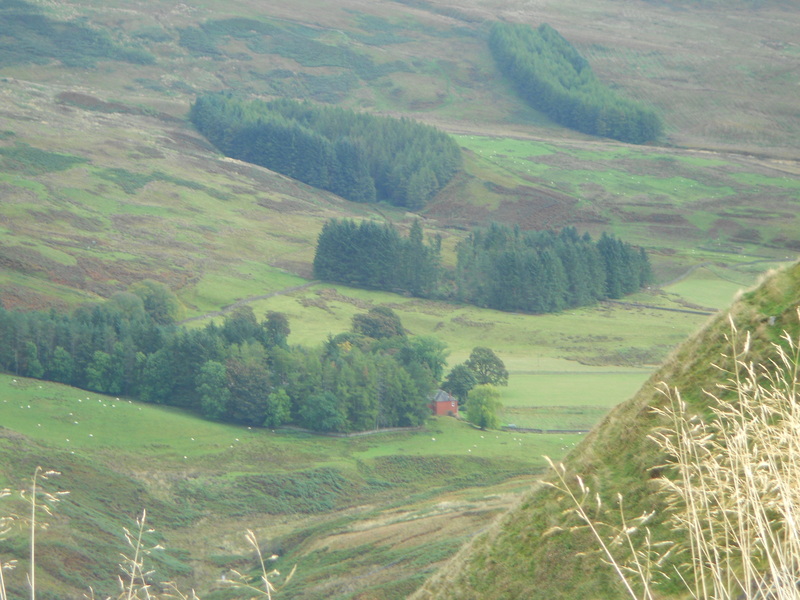 At Devil’s Beef Tub, two Covenanters had been staying at a red farmhouse in the valley, when the dragoons arrived. They ran and attempted to go to a part of the hills where the horses could not follow them. Unfortunately, John Hunter lost his life, but the second Covenanter got away. We were able to see the spot where John lost his life and the farmhouse (it’s still standing). At the Talla Linn, on the 11th of October 1682, 4,000 people met for a conventicle, and God’s provision is displayed in their meeting. The dragoons were close by, but the Covenanters remained safe and uninterrupted during their worship. The Devil’s Beef Tub, and the John Hunter farmhouse. 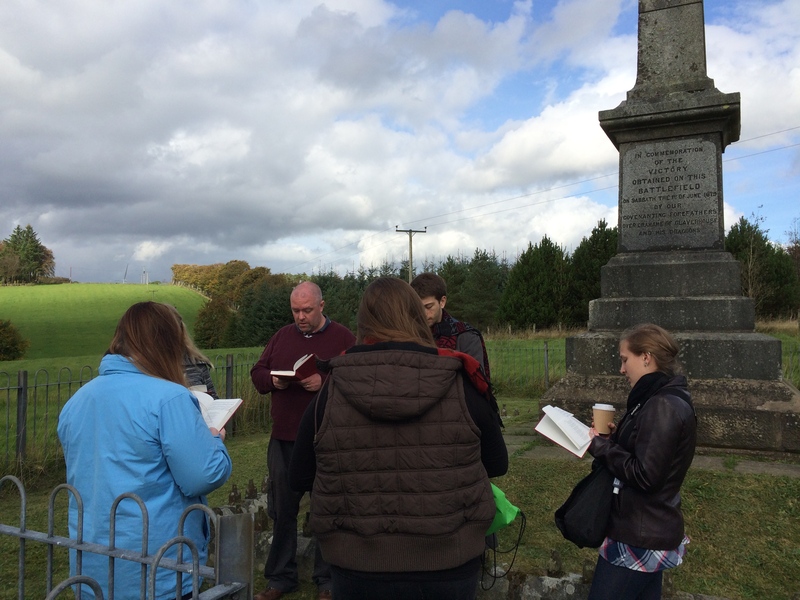 Thursday, we traveled to some of the battle sites and graves of Covenanter martyrs. We saw Bothwell Bridge, Drumclog, Ayrsmoss, and Muirkirk. 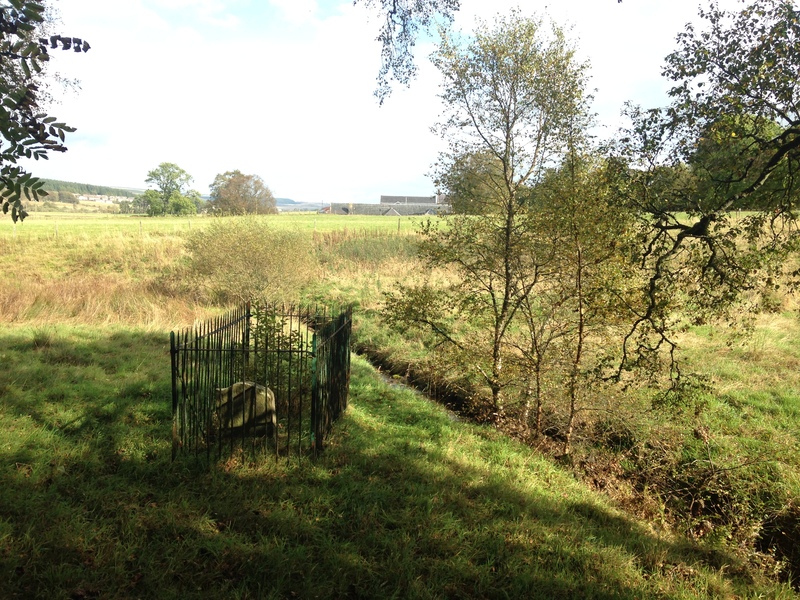 Perhaps the most moving and memorable part of the day was not a great Covenant victory site (such as Drumclog) or a site where many Covenanters lost their lives (like Ayrsmoss or Bothwell Bridge), but a quiet, peaceful, often forgotten grave of a young martyr. On the property of a farm in Muirkirk, a short walk from the farmhouse is a quiet stream where 18-year-old farm hand William Adam would meet his fiancé for lunch and Bible study each day. One day as he waited for her to arrive, the dragoons came by and saw him reading his Bible, without a word spoken they killed the young Adam. 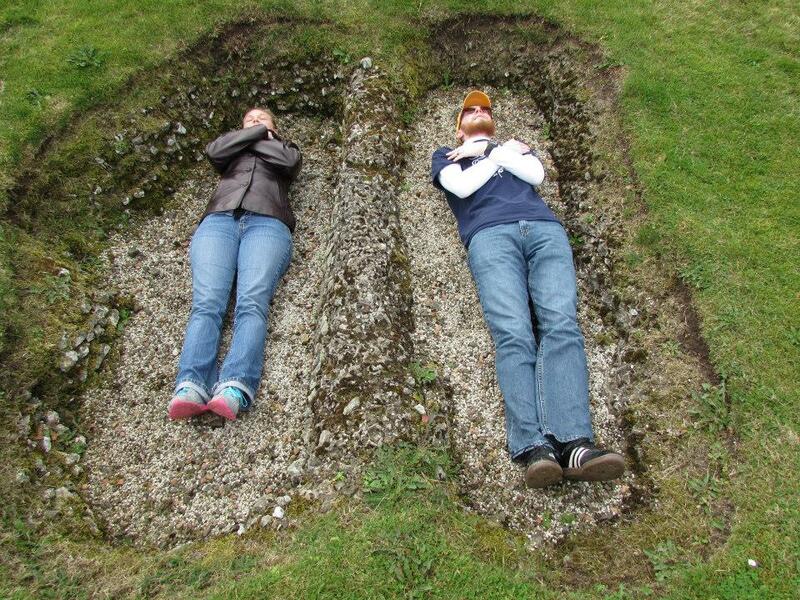 His fiancé found him dead and buried him in their picnic spot. After Prof. Jimmy told us this story, a silence fell. Debbie mentioned that the peaceful spot reminded her of Psalm 23. We got out our Psalters and sang Psalm 23 at the grave of young William Adam. When was the last time a Psalm was sung in that spot? 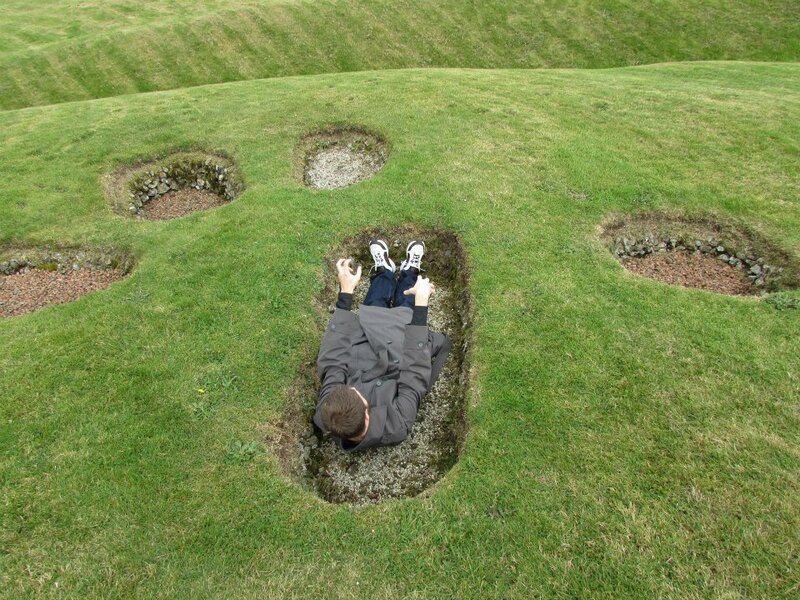 Jimmy estimated that perhaps the last time would have been when Adam’s young fiancé was burying her love or when the two had last met for lunch. Regardless of when a Psalm was last sung in that spot, the simple faith displayed by this young martyr is a reminder to all of how we should live our lives. As Jimmy told us about the Covenanters, “They simply wanted to live their lives with Christ at the forefront. They lost their lives because they would not let the king come first.” These men and women who lost their lives would not want to be remembered with any sort of a high regard. They would want us to remember to listen to God and not compromise our faith to conform to the ways of the world. Well, it wasn’t really a three hour tour, but we’ll get to that soon enough. The week started out rather slow. Monday was our usual reading day, but something was different that day. Reverend Quigley had to leave town for a few days for a pastor’s conference, and since he normally leads our morning Bible reading and prayer, he told Ethan and me to lead for the next few days. Tuesday, I led the morning reading and prayer, and then we went about our reading as usual for that day. However, since Reverend Quigley was still away, we didn’t have our Paul class that day. The girls still met for one of their Christian Ministry seminars, but since Ethan and I usually have a seminar with Reverend Quigley, we just had an off day for that. 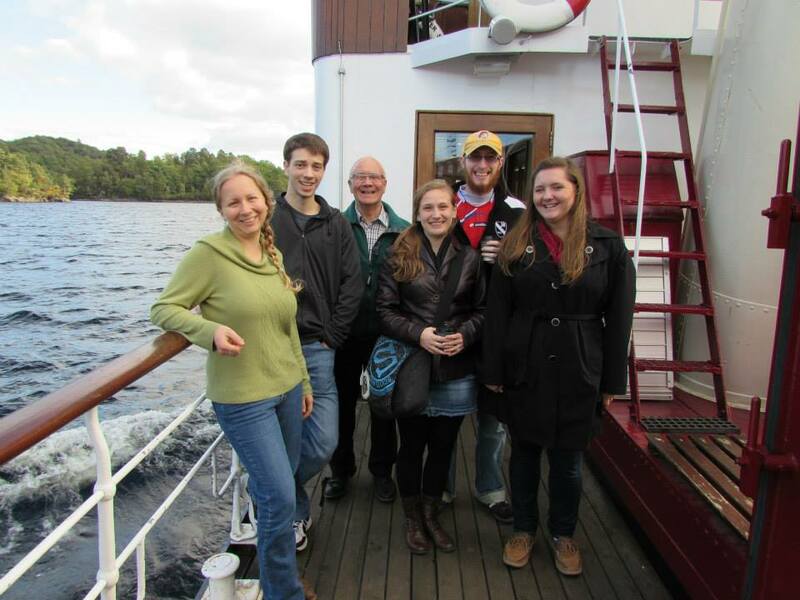 Wednesday, we had our Systematic Theology class, but it was also the day of our “three hour tour”. 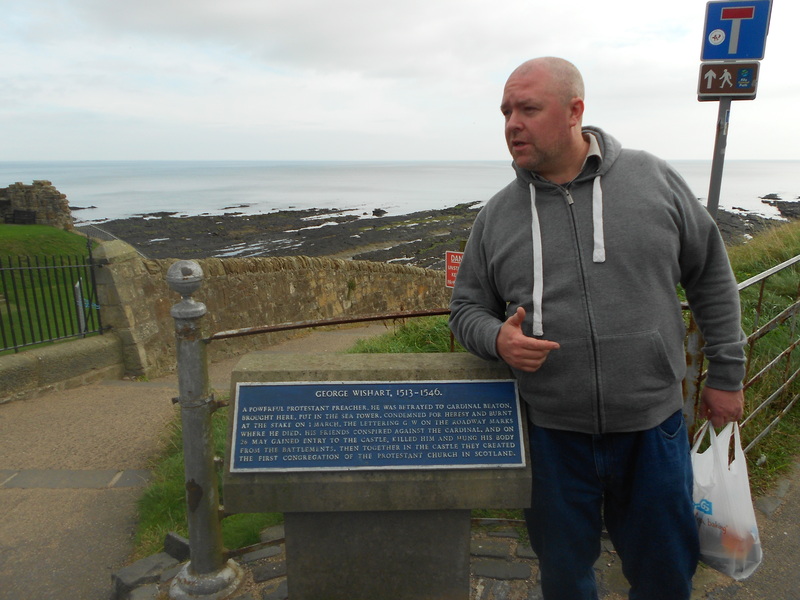 Ian Shaw took us on our day trip to various locations. We visited a hotel built in 1625, that was painted pink for some reason, and had a beautiful view overlooking a pond. Following that location, we visited the town of Callander, which lies just south of the Highland Boundary Fault, which is a meeting point between the Highlands and the Lowlands. Callander is a beautiful town, with many tea and souvenir shops. While here, Ian took us to look at a small art gallery, where people had made various pieces of art and were displaying them there with the potential of them being sold. That was our first stop in the town, as we also adventured into some of the souvenir shops and a fudge shop. 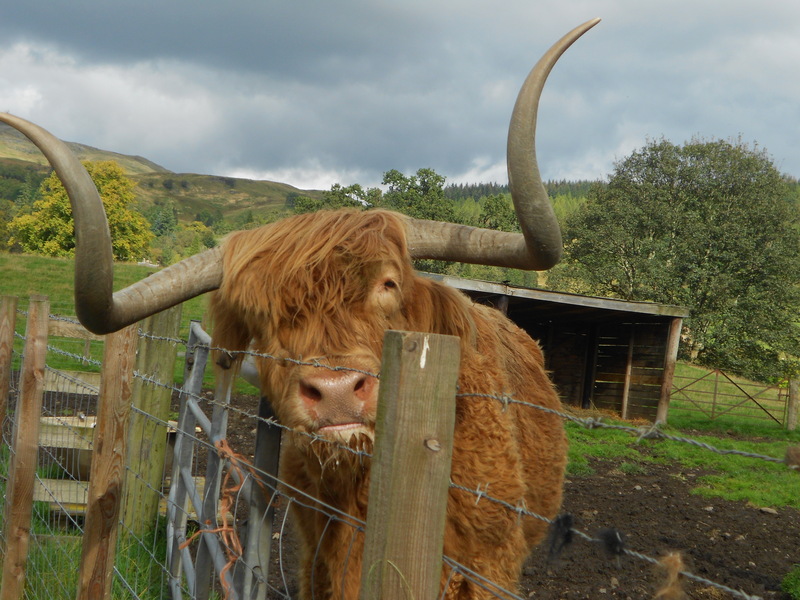 From there, we traveled to what felt like the middle of nowhere and met……a Highland cow named Hamish, and two other Highland cows that had no names that we were aware of. 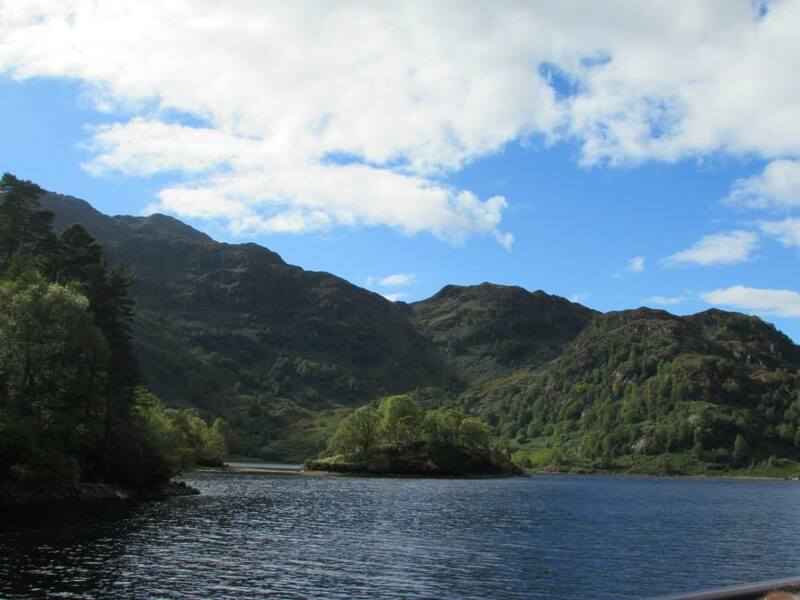 Stop number four was Loch Katrine, where our boat ride was. 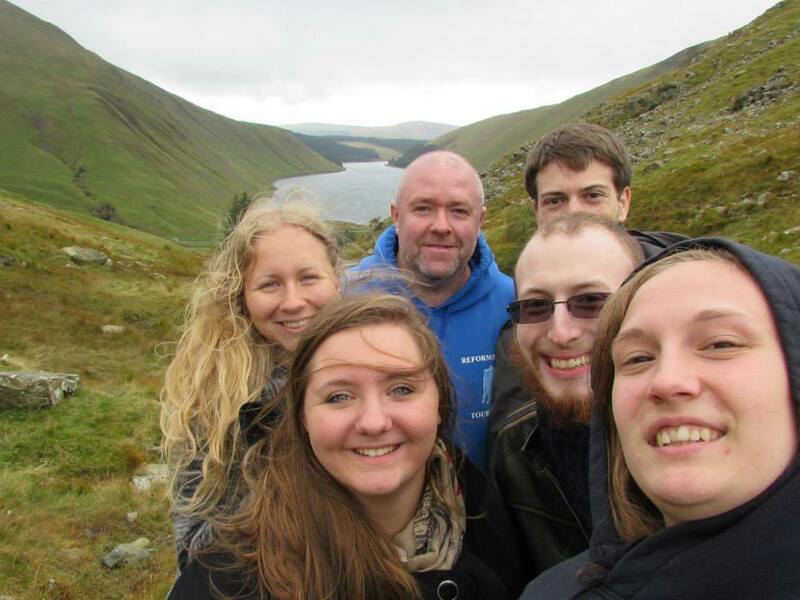 Before that started, we took some time and explored Loch Katrine’s souvenir shop. 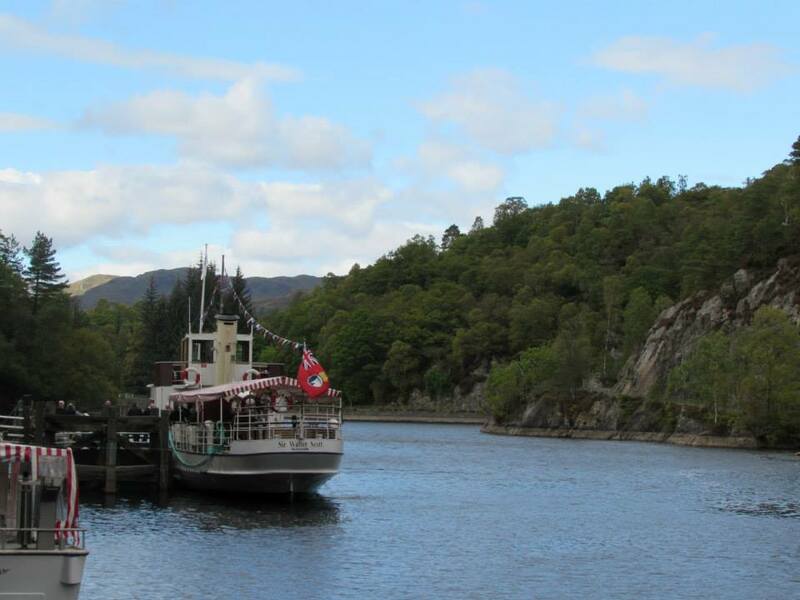 We then hopped on board a 100 year old steamboat, which was named the “Sir Walter Scott”. It was a lot of fun, and we didn’t end up stranded on a desert island. Ian then took us to Aberfoyle, where we had a fish and chips dinner from a local restaurant. We then returned to Airdrie and our group separated, the guys returned to our flat while the girls traveled to their MET (small group). On Thursday, we had our last seminar in Scottish Reformation and Covenanting History, then some relaxation time before returning to the church for Reformed Evangelism that evening. Friday arrived, and this time, we got to have our seminar on the Spiritual Disciplines book. Reverend Quigley took his time on the topic that day, stewardship with the money God gave to us, a very convicting topic for us all. After the seminar, we all went and did different things. Ethan, Debbie, and I returned to the girls’ flat, ate lunch, watched Pokémon, and got the craft ready for the kids that night. 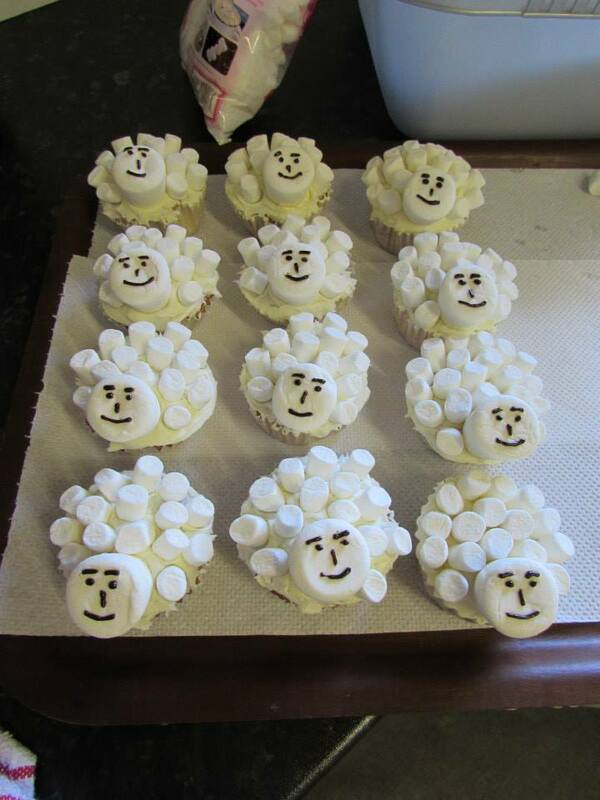 The time came to prepare the church for Kids Club, and we got to work making little sheep cupcakes for the kids. Jennie and Ethan played a game with the kids where the sheep crawl around and hide, and the shepherd has to look for them and bring them back to the sheepfold. We gave the kids the snack after that, they sang Psalms, Jennie told the kids the story of the lost sheep, and Debbie got the kids started on the craft afterwards. Jennie and Rosie then went to watch a movie with the youth while Ethan, Debbie, and I returned to the girls’ flat for some dinner and rest. Saturday came, and we were going to take an adventure to Glasgow on the train. 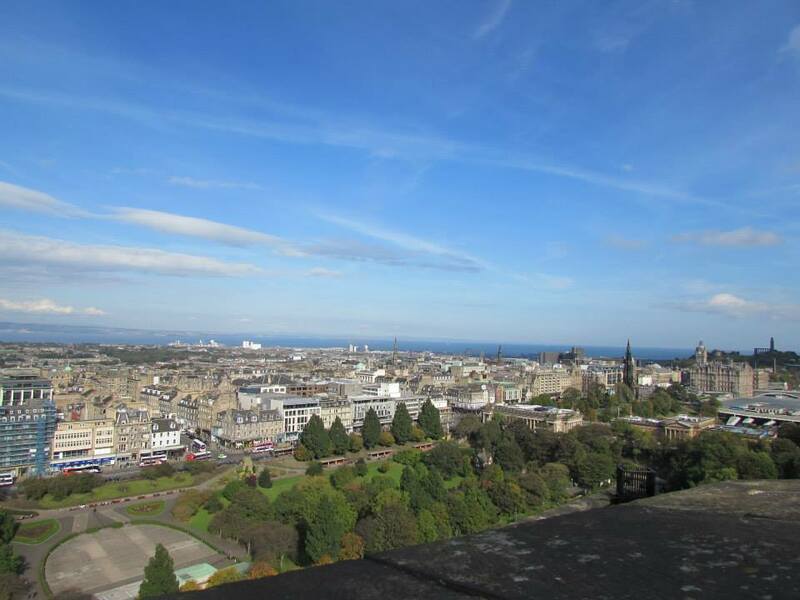 However, I came down with a short illness (whether a virus or something I ate the night before, I am not sure…leaning toward something I ate the night before), and Debbie stayed behind with me, while Ethan and Jennie continued onward to Glasgow. 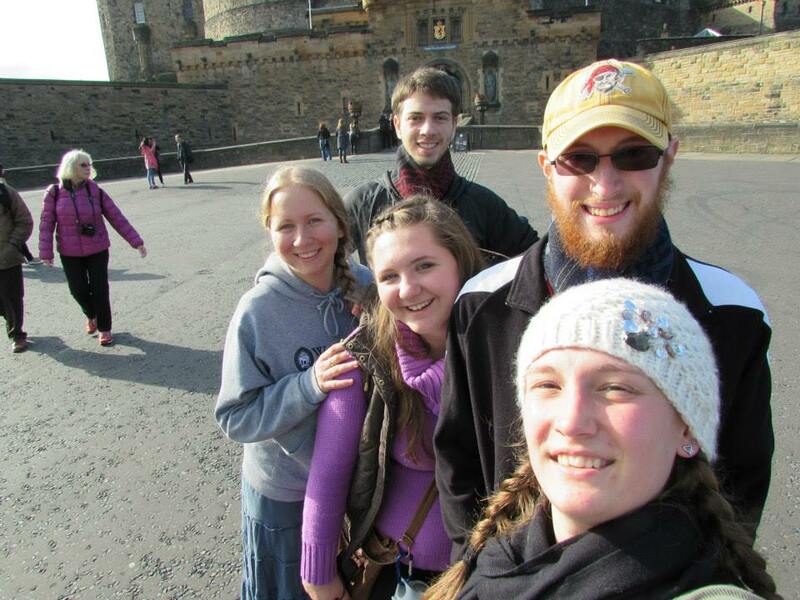 They had a great time, and Debbie and I plan on adventuring there sometime soon as well. One of the highlights of our fourth week was reading a few chapters from Douglas S. Whitney’s book Spiritual Disciplines for the Christian Life. Dr. Whitney writes that at the core of a disciplined spiritual life is a disciplined use of time. This plays out practically in our time alone with God. If we do not consciously set aside time to pray, read the Word, worship, and so on, we will neglect our time with Him. Let’s be real; life is busy. Making responsible use of our time, then, is necessary if any of the other disciplines are going to happen. This chapter was based largely on Jonathan Edward’s sermon, The Preciousness of Time and the Importance of Redeeming It. (http://www.apuritansmind.com/puritan-favorites/jonathan-edwards/sermons/the-preciousness-of-time-and-the-importance-of-redeeming-it/). Pastor Edwards suggests living each day as if, at the end of that day, you had to give an account to God of how you used your time. Sobering, beautiful stuff. I dare you to read his sermon; Puritans aren’t as hard as they’re made out to be. 😉 You can do it! 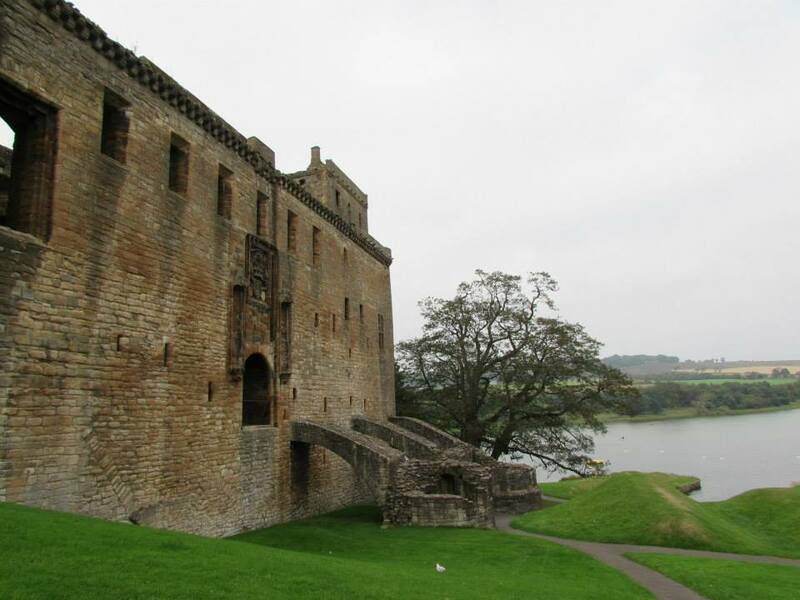 Our highlights for exploring Scotland this week were visiting both Cairnpapple and Linlithgow Palace! 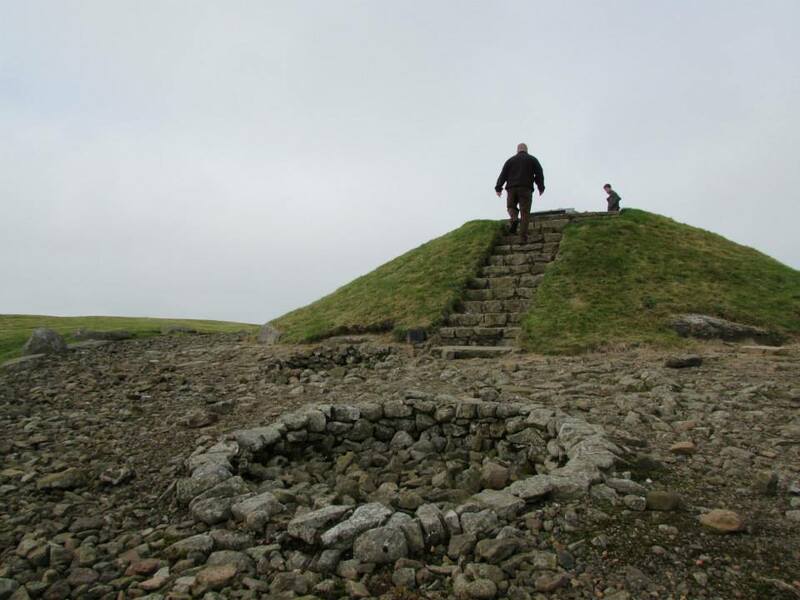 Cairnpapple is a burial and ceremonial site dating back to about 3000 BC. It took a little while for the age of this place to sink in… Three thousand years before Jesus was born! It’s amazing. Dearly departed Debbie & David. (Photo credit, Debbie). Ethan lives again! (Debbie’s pic). 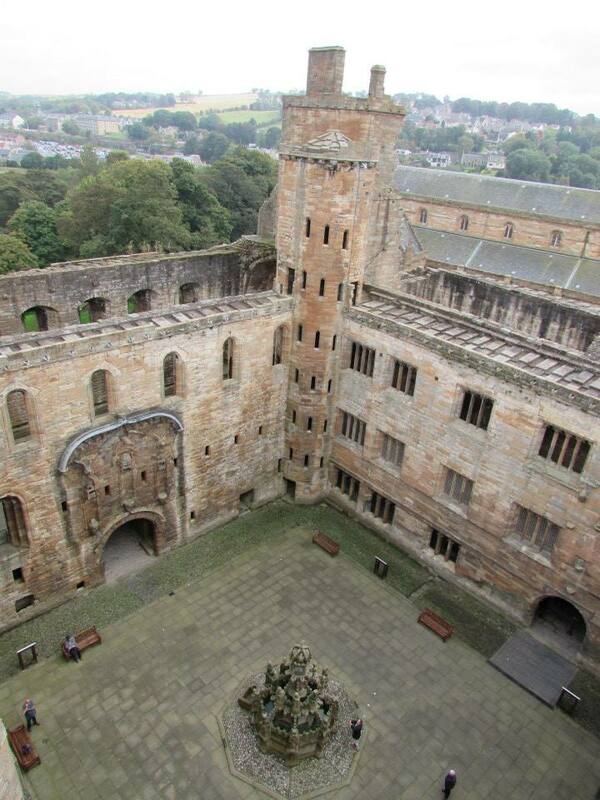 After Cairnpapple Hill, we went to Linlithgow Palace. 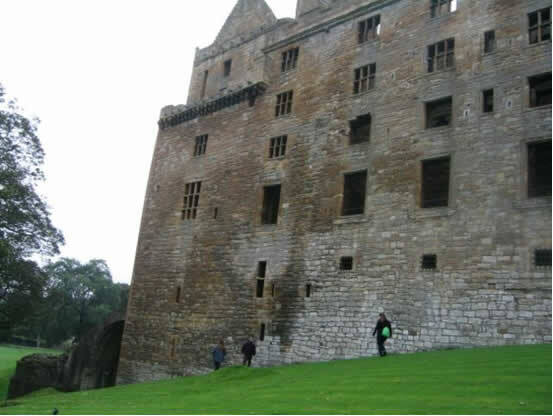 Both James V and Mary Queen of Scots were born here. The roof is no longer there, but you can climb all sorts of stairs and explore the different levels. The place is immense! Jennie & the Fishers outside Linlithgow Palace. Thanks for checking up on us! Please keep us and the church here in your prayers, that we’d keep learning lots and bless the folks here. TTFN!